The International Space Station Environmental Control and Life Support System (ECLSS) is a life support system that provides or controls atmospheric pressure, fire detection and suppression, oxygen levels, waste management and water supply. The highest priority for the ECLSS is the ISS atmosphere, but the system also collects, processes, and stores waste and water produced and used by the crew—a process that recycles fluid from the sink, shower, toilet, and condensation from the air. The Elektron system aboard Zvezda and a similar system in Destiny generate oxygen aboard the station. 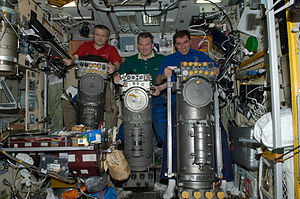 The crew has a backup option in the form of bottled oxygen and Solid Fuel Oxygen Generation (SFOG) canisters. Carbon dioxide is removed from the air by the Russian Vozdukh system in Zvezda, one Carbon Dioxide Removal Assembly (CDRA) located in the U.S. Lab module, and one CDRA in the U.S. Node 3 module. Other by-products of human metabolism, such as methane from the intestines and ammonia from sweat, are removed by activated charcoal filters or by the Trace Contaminant Control System (TCCS). The ISS has two water recovery systems. Zvezda contains a water recovery system that processes water vapor from the atmosphere that could be used for drinking in an emergency but is normally fed to the Elektron system to produce oxygen. The American segment has a Water Recovery System installed during STS-126 that can process water vapour collected from the atmosphere and urine into water that is intended for drinking. The Water Recovery System was installed initially in Destiny on a temporary basis in November 2008 and moved into Tranquility (Node 3) in February 2010. The three ECLSS racks on display at the Marshall Space Flight Center ECLSS Test Facility in 2012. From left to right, the Water Recovery System (Rack 1), WRS (Rack 2) and Oxygen Generating System. The Water Recovery System consists of a Urine Processor Assembly and a Water Processor Assembly, housed in two of the three ECLSS racks. The Urine Processor Assembly uses a low pressure vacuum distillation process that uses a centrifuge to compensate for the lack of gravity and thus aid in separating liquids and gasses. The Urine Processor Assembly is designed to handle a load of 9 kg/day, corresponding to the needs of a 6-person crew. 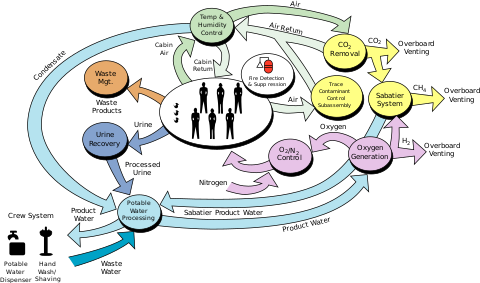 Although the design called for recovery of 85% of the water content, subsequent experience with calcium sulfate precipitation (in the free-fall conditions present on the ISS, calcium levels in urine are elevated due to bone density loss) has led to a revised operational level of recovering 70% of the water content. The Volatile Removal Assembly flew on STS-89 in January 1998 to demonstrate the Water Processor Assembly's catalytic reactor in microgravity. A Vapour Compression Distillation Flight Experiment flew, but was destroyed, in STS-107. The distillation assembly of the Urine Processor Assembly failed on November 21, 2008, one day after the initial installation. One of the three centrifuge speed sensors was reporting anomalous speeds, and high centrifuge motor current was observed. This was corrected by re-mounting the distillation assembly without several rubber vibration isolators. The distillation assembly failed again on December 28, 2008 due to high motor current and was replaced on March 20, 2009. Ultimately, during post-failure testing, one centrifuge speed sensor was found to be out of alignment and a compressor bearing had failed. Several systems are currently used on board the ISS to maintain the spacecraft's atmosphere, which is similar to the Earth's. Normal air pressure on the ISS is 101.3 kPa (14.7 psi); the same as at sea level on Earth. "While members of the ISS crew could stay healthy even with the pressure at a lower level, the equipment on the Station is very sensitive to pressure. If the pressure were to drop too far, it could cause problems with the Station equipment.". Carbon dioxide and trace contaminants are removed by the Air Revitalization System. This is a NASA rack, placed in Tranquility, designed to provide a Carbon Dioxide Removal Assembly (CDRA), a Trace Contaminant Control Subassembly (TCCS) to remove hazardous trace contamination from the atmosphere and a Major Constituent Analyser (MCA) to monitor nitrogen, oxygen, carbon dioxide, methane, hydrogen, and water vapour. The Air Revitalization System was flown to the station aboard STS-128 and was temporarily installed in the Japanese Experiment Module pressurised module. The system was scheduled to be transferred to Tranquility after it arrived and was installed during Space Shuttle Endeavour mission STS-130. The Oxygen Generating System (OGS) is a NASA rack designed to electrolyse water from the Water Recovery System to produce oxygen and hydrogen. The oxygen is delivered to the cabin atmosphere. The unit is installed in the Destiny module. During one of the spacewalks conducted by STS-117 astronauts, a hydrogen vent valve required to begin using the system was installed. The system was delivered in 2006 by STS-121, and became operational on 12 July 2007. From 2001, the US orbital segment had used oxygen in a pressurized storage tank on the Quest airlock module, or from the Russian service module. Prior to the activation of the Sabatier System in October 2010 hydrogen and carbon dioxide extracted from the cabin was vented overboard. The Sabatier system closes the loop in the ECLSS by combining waste hydrogen from the Oxygen generating system and carbon dioxide from the station atmosphere using the Sabatier reaction and preserving these valuable chemicals. The outputs of this reaction are water, and methane. The water is recycled to reduce the total amount of water that must be carried to the station from Earth, and the methane is vented overboard by the now shared hydrogen vent line installed for the Oxygen generating system. Elektron is a Russian Electrolytic Oxygen Generator, which was also used on Mir. It uses electrolysis to produce oxygen. This process splits water molecules reclaimed from other uses on board the station into oxygen and hydrogen via electrolysis. The oxygen is vented into the cabin and the hydrogen is vented into space. The three Russian Elektron oxygen generators on board the International Space Station have been plagued with problems, frequently forcing the crew to use backup sources (either bottled oxygen or the Vika system discussed below). To support a crew of six, NASA added the oxygen generating system discussed above. In 2004, the Elektron unit shut down due to (initially) unknown causes. Two weeks of troubleshooting resulted in the unit starting up again, then immediately shutting down. The cause was eventually traced to gas bubbles in the unit, which remained non-functional until a Progress resupply mission in October 2004. In 2005 ISS personnel tapped into the oxygen supply of the recently arrived Progress resupply ship, when the Elektron unit failed. In 2006 fumes from a malfunctioning Elektron unit prompted NASA flight engineers to declare a "spacecraft emergency". A burning smell led the ISS crew to suspect another Elektron fire, but the unit was only "very hot". A leak of corrosive, odorless potassium hydroxide forced the ISS crew to don gloves and face masks. It has been conjectured that the smell came from overheated rubber seals. The incident occurred shortly after STS-115 left and just before arrival of a resupply mission (including space tourist Anousheh Ansari). The Elektron did not come back online until November 2006, after new valves and cables arrived on the October 2006 Progress resupply vessel. The ERPTC (Electrical Recovery Processing Terminal Current) was inserted into the ISS to prevent harm to the systems. Another Russian system, Vozdukh (Russian Воздух, meaning "air"), removes carbon dioxide from the air based on the use of regenerable absorbers of carbon dioxide gas. Temperature and Humidity Control (THC) is the subsystem of the ISS ECLSS concerned with the maintenance of a steady air temperature and the control of the moisture in the station's air supply. Thermal Control System (TCS) is a component part of the THC system and subdivides into the Active Thermal Control System (ATCS, PDF document) and Passive Thermal Control System (PTCS). Controlling humidity is possible through lowering or raising the temperature and through adding moisture to the air. Fire Detection and Suppression (FDS) is the subsystem devoted to identifying that there has been a fire and taking steps to fight it. Wikimedia Commons has media related to ISS Life support system. ^ a b c d D.Layne Carter (2009). "Status of the Regenerative ECLSS Water Recovery System (2009-01-2352)" (PDF). NASA/SAE. Retrieved 17 September 2014. ^ a b c Layne Carter (2010). "Status of the Regenerative ECLS Water Recovery System" (PDF). NASA. Retrieved 17 September 2014. ^ a b Robert M. Bagdigian; Dale Cloud (2005). "Status of the International Space Station Regenerative ECLSS Water Recovery and Oxygen Generation Systems (2005-01-2779)" (PDF). NASA/SAE. Retrieved 17 September 2014. ^ a b c d "International Space Station Environmental Control and Life Support System" (PDF). NASA. Retrieved 25 January 2010. ^ "5–8: The Air Up There". NASAexplores. NASA. Archived from the original on 14 November 2006. Retrieved 31 October 2008. ^ "STS-128 Press Kit" (PDF). NASA. 18 August 2009. Retrieved 1 September 2009. ^ "International Space Station Status Report: SS07-01". NASA. 5 January 2007. Retrieved 25 January 2010. ^ Chris Bergin (12 July 2007). "Oxygen Generating System activated onboard ISS". NASASpaceflight.com. Retrieved 25 January 2010. ^ Administrator, NASA Content (17 August 2015). "The Sabatier System: Producing Water on the Space Station". NASA. Retrieved 23 January 2018. ^ Amit Asaravala (20 September 2004). "Space O2 Generator Fails Again". Wired News. Retrieved 25 January 2010. ^ Tariq Malik (4 January 2005). "Repaired Oxygen Generator Fails Again Aboard ISS". Space.com. Retrieved 25 January 2010. ^ William Harwood (18 September 2006). "Oxygen generator problem triggers station alarm". Spaceflight Now. Retrieved 25 January 2010. ^ "International Space Station Status Report #48". NASA. 3 November 2006. Retrieved 25 January 2010. ^ "In-Flight Carbon Dioxide Exposures and Related Symptoms: Association, Susceptibility, and Operational Implications" Archived 27 June 2011 at the Wayback Machine (see page 6), NASA, June 2010.